Big-box retailers have tightened their quality requirements on food manufacturers, and with good reason. Regulations are deepening as the regulators gain more authority over the marketplace. Consumers are becoming more educated and aware about the food they buy. One indicator of the industry’s response is that nearly all food suppliers’ mission/vision statements contain powerful language about their commitments to quality, health, and trust. Both food manufacturers and food retailers have an enormous responsibility in providing consumers with safe, contaminant-free food. Liability is a major concern for both parties, as contaminated products can cause sickness, injury, or even death. Should either unfortunately occur, it's a very difficult incident for a company to recover from. Further, food recalls can be very costly — the average food recall costs a company around $10 million. Brand reputation and consumer confidence are also at risk for manufacturers and retailers when products must be recalled. In the digital age, news travels quickly through the internet and social media. If recalls aren't addressed and remedied swiftly, damage to brand reputation and consumer loyalty can further escalate monetary losses. As food production plants become faster and more automated, the risk for foreign-body contaminants in final products rises. High-speed automation can cause more machinery wear and failures that that drop machine fragments into lines. Unwanted product pieces, such as bones from meat trimming, find their way into processing. Naturally occurring objects, such as stones from field harvest, enter the production process. In response, retailers have become more vigilant about maintaining strict quality specifications from suppliers. Most retailers have standard, product-specific policies for food manufacturers. For instance, a large retailer will set a policy for bone fragments within ground beef. All ground beef producers wishing to sell their products to that retailer must meet the retailer's requirements. Big-box retailers and regulators holding food manufacturers to a higher standard is just the beginning. As time progresses, we expect policies, requirements, and regulations will only become more stringent. So, what can be done to prepare for them? A plant's quality champion should absorb as much information at every opportunity possible and share it with colleagues. Trade shows provide an excellent opportunity to network with both peers and solutions providers to learn the latest state-of-the-art technologies and best practices. Find 0.8 mm (or smaller) stainless steel in most food products. Achieve false reject rates of no more than 5 in 10,000 inspections. How can food manufacturers meet big-box retailers' requirements while running cost-efficient and productive processing lines? The answer lies in choosing the right product inspection technology. In many cases, X-ray inspection offers the most effective solution to detect and eliminate contaminants. The cost of X-ray systems may present financial obstacles for small operations looking to do business with large retailers. To combat this, retailers may offer incentives to their trusted suppliers to meet the requirements. This could include, for example, setting aside a small percentage of every pound of product sold for the supplier to purchase the required equipment. Finding the best inspection technology for your unique business is imperative. One of the biggest mistakes a food manufacturer can make in their search for inspection equipment is to buy the first available option without research. When buying a car, do you just go out and buy the first one you come across? Or do you search for a car that provides the features and conveniences you desire at an affordable price? Buying inspection technology is no different. There are a wide variety of suppliers and models with numerous features, specifications, and application suitability. Fulfill the requirements of the retailer and their audits. Meet the food manufacturer's needs and parameters and their internal audits, as well as third-party audits they are subject to. From there, manufacturers should research vendors and systems capable of meeting those criteria. This can include asking advice from retailers and other processors that make similar products, as well as conducting independent research. In most cases, several companies will claim to meet all the manufacturer's inspection needs, so it's important to thoroughly test the equipment from all potential vendors. The right inspection equipment will meet or exceed the contaminant specs of the retailer, the manufacturer, and the third-party auditor. Here are some critical questions to ask when evaluating the performance of X-ray candidates. What are your primary contaminant goals (type and size)? Does the equipment repeatedly meet the contaminant specifications at actual production speed, with actual products? Do the contaminant test samples faithfully represent the test goals? Is the inspection system giving false rejects? If yes, how frequently? Is it possible to have the inspection equipment meet virtual-zero false rejects — between one and five per 10,000 inspected products — based on the manufacturer's potential contaminants and size? Cost of the equipment is another important consideration, but not just the up-front capital investment. Be sure to review the total cost of ownership (TCO) over the life of the inspection system. Other cost factors include parts, durability, labor, and energy consumption. Equipment, the durability of parts, along with the cost of replacement parts and maintenance should also be addressed. What kind of warranty does the equipment come with? Is servicing the machine incorporated into the initial cost of the equipment or are there additional charges for diagnostics, parts, and service? X-ray inspection equipment has two expensive replacement parts: the tube and the detector. Be sure to consider how long these parts will last and the costs associated with replacing them. It’s also important to understand the relationship between high performance and low-power use. Typically, power settings on X-ray inspection equipment will affect the longevity of it and its components. At higher power settings, components fail sooner. At lower power settings, image quality and detection limits can be compromised. Anritsu has developed technology to offer end users the benefits of high-power use and machine longevity. Learn more about it here. Another important consideration is labor. How many person hours will it take to operate the inspection equipment each day? Is the machine labor-intensive or highly automated? How much training will be required for end users to properly and effectively use the equipment? The answers to these questions will play a part in the decision-making process. Remember to also factor in energy consumption. How much power will the inspection use during operation? Does the inspection system have power-saving capabilities when not being used? Less power contributes to a lower cost of ownership. Virtual Weighing — By estimating weight from the X-ray image density, the system can help you find over-/underweight products. Package and Product Defects — The machine may have algorithms that can identify deformed or broken products or packages with product caught in the seal area. Component Counts — This function finds packages with the wrong number of components; for example, those missing a donut or having too many in a one-dozen package. Virtual Zone Weighing — This is similar to full-product weighing, but instead can identify specific areas in your package that are over-/underweight. Availability — all events that stop planned production long enough where it makes sense to track a reason for being down. 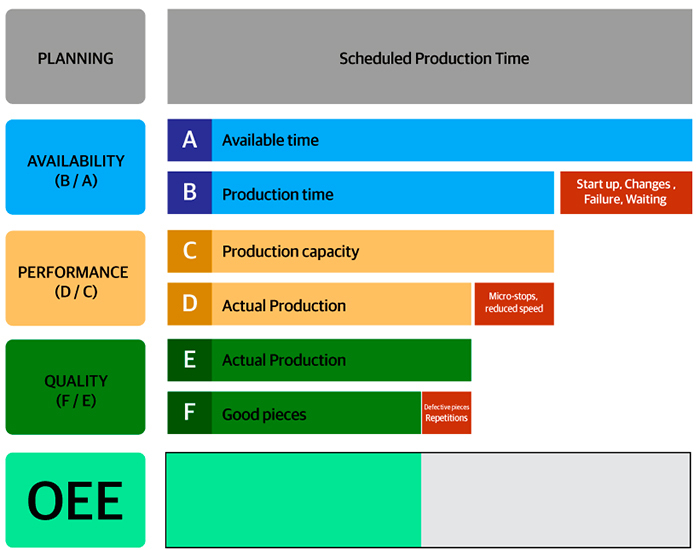 (Availability = Run Time/Planned Production Time). Performance — anything that causes the manufacturing process to run at less than the maximum possible speed when it is running. (Performance = (Total Count/Run Time)/Ideal Run Rate). Quality — takes into account manufactured products that do not meet quality standards, including products that need rework. (Quality = Good Count/Total Count). A typical OEE target might be 75 percent, which is far more difficult than it appears. For example, if availability, performance, and quality are all 90 percent, the OEE percentage would fall short of the 75 percent goal, at about 73 percent (0.90 x 0.90 x .0.90 = 0.729). OEE provides an accurate picture of how effectively manufacturing processes are running and easily tracks progress over time. The figure below helps illustrate the OEE calculation. The following are OEE factors specific to X-ray inspection. Detection – The degree to which you can identify and remove contaminated products from production. False rejects – The rate that uncontaminated products are incorrectly rejected as contaminated. Both of the above solutions are possible using the same system, simply by changing the menu to meet the application needs. This additional headroom against false rejects provides more latitude to tune performance when optimizing production. The ability of inspection machines to provide comprehensive data is critical to track and trace requirements, troubleshooting, and production optimization. The data should be accessible on-screen, via USB export and via industrial networking protocols like EtherNet/IP or OPC UA. For example, your quality or operations team sees an upward trend in rejected products while monitoring the status of sliced cheddar cheese packages. Examining the X-ray images in the data archive offers clues as to the contaminant type, which may help identify the causal source of the contamination. The X-ray image also precisely shows where the contaminant resides in the product, which can aid in retrieving the contaminant and making quick, informed decisions. Or, in the event of a recall, your quality manager can reach into the data to not only help identify the contamination source, but also the scope of potentially contaminated products. Service, support, and an ongoing partnership should also be integral parts of searching for an inspection technology provider. Phone and web support should be available for inspection systems 24 hours per day, 365 days per year. Tech support over the phone should be able to guide end users through most errors, problems, and malfunctions. End user training should be included in the initial purchase. A comprehensive kit of spare parts — photo eyes, X-ray shield curtains, belts, and rollers — should be considered in the initial equipment investment. Should the issue require a technician to visit the plant, the technician should be on-site within 24 hours of reporting the problem. Again, the cost of labor, parts, repair, and downtime should also be considered. How much will the inspection system being down cost, and is there a plan to recover that lost revenue? A big part of continually exceeding retailer requirements comes down to inspection equipment choices. X-ray solution providers vary widely in performance, cost, reliability, and application suitability. Making the right choices alleviates concerns over shipping contaminated products, which leaves you more time to focus on production. The primary consideration for purchasing X-ray equipment may be to repeatedly detect and remove the smallest possible contaminants, but as you can see, the decision process involves far more. You’ll also consider its ability to exceed performance requirements, estimate the equipment’s lifetime cost, evaluate service and support offerings, and consider the supplier’s character. 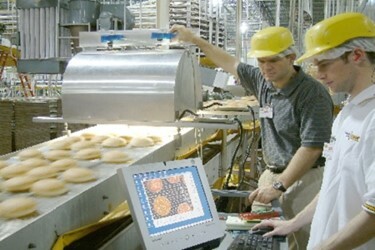 As big retailers pressure food manufacturers to improve quality, manufactures need to up their inspection game. This means investing in better product inspection technology or risk losing retail customers and their consumers. Although X-ray inspection equipment is a substantial expense, it can rapidly pay for itself if you purchase the right solution for your environment and application. Based in Japan, Anritsu was established as an electronics company in 1895, innovating test and measurement technologies for well over a century. The company manufactures more than 1,200 X-ray machines annually and is the largest food X-ray inspection system provider in the world. Anritsu engineers and manufactures its equipment in-house with top-tier components, offered at competitive pricing. Its X-ray systems are regularly regarded as having the industry’s best performance.